Create an account at https://cloud.code-cruiser.com/register. (!) You need to verify your email to make your account active. A free tariff would be assigned to you by default. No additional actions needed. In Configuration Application press main menu Build > Export. Enter your login name and password from sign up form. 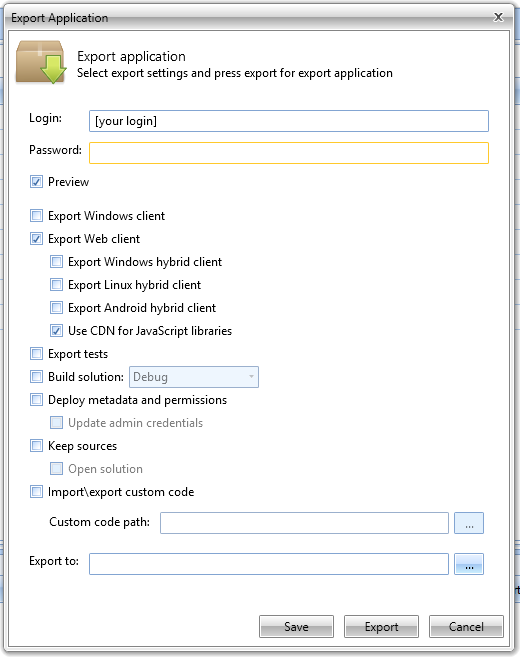 Select "Export Web Angular Client" and "Preview" options then press Export. Deployment process will take some time. Approximately 15 minutes. After generation process you will see an url link for your newly build application. It will be available for 3 hours, after that it would be removed from our server. To log into your application you can use default credentials login: admin, password: admin. Preview mode is free and is useful to check if your application functioning correctly. To receive binary files or source code you should activate appropriate tariff (Single Use, Pro or Unlimited). See Tariff Activation section for detailed explanation of how to select and enable tariffs. That's pretty much it. Welcome to Code Cruiser!